Yup. It’s that time again. Time to do the thing called Legislative Report. 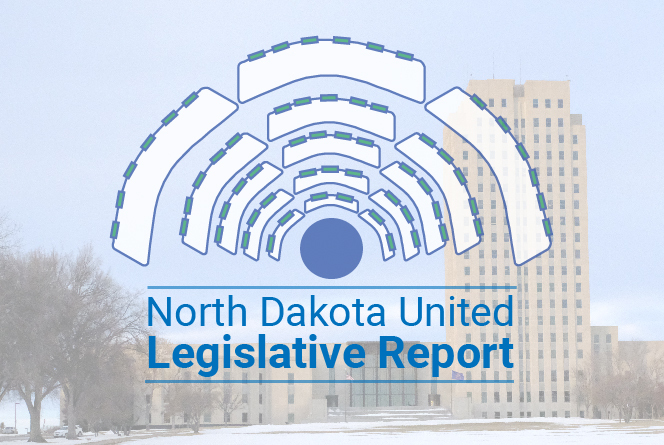 We start off this week’s Legislative Report with the video of the NDU Legislative Update, featuring President Nick Archuleta and Public Affairs Director Tom Gerhardt, talking about all the things I’m about to write about, but on video. So they’re using their voices, and I’m typing with my fingers. Everybody’s got their ways of doing things, I’m just trying to say. And now, all that typing I said I was gonna do! You’ve heard a whole lot about this bill, specifically, the past couple of months. This may be the last time you will. It’s headed toward a committee vote today, and will most likely go to the Senate floor for a vote sometime this week. CLICK HERE to send a quick, easy e-mail to your Senator, and say no to HB 1347! This is the bill that will increase the length of time that teachers remain on “probation” after being hired. Currently, that period of time lasts one year, which is comparable to the private sector and among other classifications of public employees. HB 1347 seeks to increase that probationary period to three years. Your administrators don’t stay on probation for three years. Think about that. I’ll go a little off script here, and tell you that we totally get why many of our teachers, who are already past those three years, or our public employees, higher education faculty and staff, and education support professionals, aren’t engaged on this issue. Because it doesn’t affect you! But. It. Does. We are North Dakota United for a reason. We can all work together on this issue, send a message to VOTE NO on HB 1347, and make the loudest possible noise to our legislators. A noise so loud, they have to hear it, and they cannot ignore us. This is that time. Now or never. Anybody remember SB 2320? It was a lengthy bill, supposedly dedicated to allowing freedom of speech on public university campuses across our state. We were initially opposed to this bill because it went too far, and would expose university professors to litigation for saying the wrong thing. That language was removed from the bill before it went up for a vote in the Senate, and it passed, 35-10. It heads to the House Education Committee this morning, March 26, at 9 a.m. … and that same problematic language is going right back in. HB 1332 — “A BILL for an Act … relating to the carrying of a concealed firearm on school property by qualified individuals; and to amend and reenact subsection 2 of section 62.1-02-05 of the North Dakota Century Code, relating to an exception to the prohibition against possessing a firearm at a public gathering.” Later this week, the Senate Energy and Natural Resources Committee will finish their work on this bill, referred to as the “armed first-responder” bill, and it will head to the floor for a vote. Bottom line, our members are opposed to having anyone except trained school resource officers carrying guns around in schools. Oppose. HB 1206 — “A BILL for an Act … relating to a class 1 exempt firearm license; and … relating to possession of a concealed firearm or dangerous weapon at a public gathering.” Basically, it allows anyone who has a “valid class 1 exempt license” to walk around with a concealed weapon wherever they choose, including schools, sporting activities and public spaces. This, too, will be back in committee later this week, and we hope to see if improved by a whole lot, or defeated. Oppose. The sound that people make when they want me to look at them is Kelly Hagen, NDU communications director, and you can get my attention by clicking on that link and sending me a message. 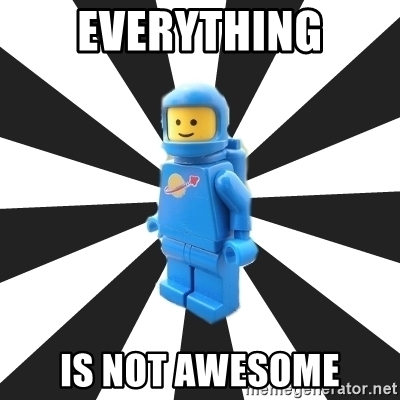 I’m still kinda feeling like “Everything is not awesome,” but all of you can help to fix that feeling inside me by contacting you senator on HB 1347, and get active, get vocal about these bills involving freedom of speech in higher ed, guns in schools and public spaces, appropriations for K-12 education, higher education and state agencies, and everything else you’ll be hearing about from us really soon. See you again next week!